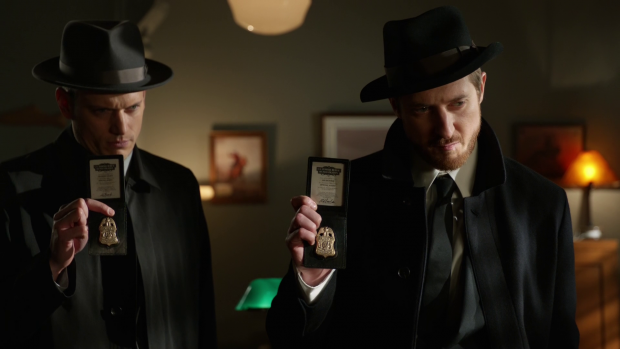 DC’s Legends of Tomorrow takes the team to 1958 to find Vandal Savage in the Oregon Suburb Pleasant Falls. Ever since this show was announced I was looking forward to a time traveling superhero story as it combines two of my favourite things into one convenient package. This episode goes a long way towards illustrating why I wanted this show to exist in the first place as it fully embraces the time travel concepts and truly has the characters dealing with an era of history that they are completely unfamiliar with. One point DC’s Legends of Tomorrow has always had in its favour is the diverse team. Not all of the characters are white and one of the female leads is a bisexual. None of this has ever had attention drawn to it so it just sits in the background as a fact of life that nobody on the crew bothers about. The diversity makes time travel stories more interesting as certain characters simply can’t blend into the earlier time periods that they visit. Racism is one of the central themes of this episode with Jax and Kendra both facing the casual racism of the townspeople. It is represented in a number of ways such as direct confrontations to people in the background simply staring at them as they go about their business. It’s an unenlightened time and the episode isn’t afraid of showing it. Racial slurs are kept to a minimum but that is to be expected from a network TV series. The scene that best illustrates the racism of the era is when Jax gets pulled over with an injured Betty (Melissa Roxburgh) in the car and tries to appeal to the better nature of a cop who immediately believes the worst of him. Despite Jax’ impassioned and sincere plea for help in the situation he still finds himself attacked. I like that Jax wasn’t ignorant to the situation but still tried to talk his way out of it anyway. Kendra faces similar issues by always being confused for “the help” by the backwards people of Pleasant Falls. The cover story is that she and Ray are a young married couple who have recently moved into the neighbourhood. The fact that she is his wife not his maid is something that both of them have to constantly remind people of. Kendra always seems irritated when people say that but she also manages to turn the other cheek and politely correct them. She understands that these people are a product of their time rather than being bad people. There is a tendency in fiction to romanticise the 50s because of the design of the clothes, the cars and the way that people spoke with little done to address the backwards way of thinking that many people had back then. Stein represents this romanticised view when he describes it as “idyllic” only to be reminded that it’s easy because he’s a straight white man so isn’t affected by the prejudice that runs rampant in this time. It doesn’t take long for Stein to realise that he’s caught up in the romance of the era and has forgotten the problems that other members of the team will suffer. In many ways it shows how progressive he is as the fact that they will face prejudice didn’t even occur to them because he doesn’t label them in that way. Jax is just Jefferson to him, not “the black guy” for instance. Not realising the obvious makes him a little naïve but it’s interesting how casually progressive this team is. Franz Drameh really gets a chance to shine in this episode by having his own mission in 1958. He bonds with Betty to find out information about her missing boyfriend. It creates a temporary romantic connection for him as he clearly starts to really care about her. He finds that she’s really progressive in a time that isn’t progressive and that is something he really appreciates especially after he has to defend himself against two bullies that pick on him simply because he’s black. Betty never sees him that way though the way she throws herself at Jax when her boyfriend had only recently gone missing doesn’t quite work and her grief over the loss is inconsistent. With a little more screen time this could have been fixed. Jax basically takes on the Marty McFly role in this story as evidenced by him calling one of the bullies Biff. It even ends with him giving a couple his blessing before returning to his own time. I feel like there is a larger Jax centric narrative that parallels Back to the Future hidden in here somewhere that never quite gets the chance to develop. I enjoyed Ray’s reference to the “Enchantment Under the Sea” dance but it just made me want to see more of this. Jax is a really engaging character when he is given the opportunity to be active in the plot so I’m keen to see him take more of a leading role. Kendra going against Savage now that they have access to the dagger that will allow her to kill him is a better use for the character than having her whine about recently being a Barista. It’s a shame that Kendra’s role has moved from one romantic entanglement to another but at least she is shown to be confident and self-assured. When she actually takes Savage on she proves to be out of her depth but her desire to go it alone shows that she has inner strength that is really starting to assert herself. A lesson for her to learn is to accept help in the form of backup and know her own limitations. Kendra and Ray’s forced romance was something that I wasn’t all that enthusiastic about last week but it is used to good effect here. Having them pretend to be husband and wife while they are at the start of a relationship is a nice touch that makes their cover story more believable. Ciara Renée and Brandon Routh have really good chemistry despite their characters not making much sense as a couple so their scenes together are a lot of fun to watch. The highlight in this episode was their dance in their pretend home. Maybe I’m thinking too much into this but this plot had me wondering what happens to this house once they’re gone. Clearly it was bought by them so did they sell it before moving on or do Ray Palmer and Kendra Saunders own a house in 1958 that has nobody living in it? I assume that there is technology on the Waverider that lets them establish a cover that exists in government databases and create period currency as well. If there isn’t then having people blend into given time periods makes no sense but the lack of consistency of the application of this technology really irritates me as a science fiction fan. It can apparently create documentation that will let people buy a house or pose as a renowned psychiatrist but can’t create universal keycards that will work anywhere. Stein and Sara’s cover as a psychiatrist and his nurse wasn’t as significant as Jax and Kendra’s but proved to be an important opportunity for Sara to develop. She finds herself drawn to closeted lesbian Nurse Lindsey Carlisle (Alie Liebert) who fears society’s reaction to her feelings that differ from the expected norm. Sara being bisexual plays into this significantly as she is confident in her sexuality and doesn’t see any preference as wrong. Stein questions why Sara would encourage Lindsey to come out during a sexually repressed time period because of the difficulties that will undoubtedly cause for her throughout her life. Sara’s response is that she would love for someone from the future to tell her that everything will turn out fine so she relishes the chance to support someone in that way. The romance between Sara and Lindsey is nicely understated and not at all sensationalised. It is treated like any other “normal” relationship should be and rightly so. I also like that it ties into Sara feeling detached from life since her resurrection and struggling with the fact that she is connecting to someone again. Sara is a vulnerable character in a lot of ways who hides behind being detached from her humanity so to have that returning in this way makes her feel uneasy. There is scope for this relationship to develop in the next episode as well as the idea of Sara’s humanity re-emerging. Caity Lotz plays these complex emotions well and brings real depth to Sara at all points. She is definitely one of the more engaging characters in the show. Stein is really suffering from having a comic book Doctorate. By that I mean being a scientist makes him every kind of scientist. He’s able to cure Jax through knowledge of genetics even though he’s a physicist. Basically if there is ever any science needing done then either he or Ray will instantly know the answer despite the fact that neither of them are experts in a given field. Rip and Snart team up and pretend to be government agents investigating the disappearances. There’s very little to this part of the story other than Snart chewing the scenery and Rip’s excellent American accent. Snart’s contribution to the story is more passive as people are apprehensive about him after he supposedly killed Mick. Jax in particular doesn’t trust him and expects betrayal from him at every turn. Stein has a similar hang-up but Snart proves his loyalty when he subdues the mutated Jax rather than killing him. 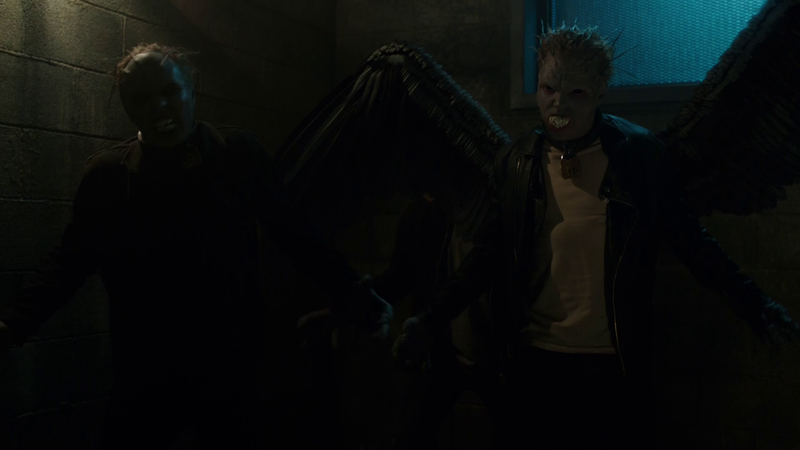 This causes Stein to see his actions as heroic and Jax to realise that Snart is part of the team and dealing with Mick was something he did to protect the group. It’s a fairly obvious life lesson for those involved but it works really well. The question of what happened to Mick is still lingering but I’m sure it will be answered soon enough. Another weakness is that there was absolutely no justification for his plan at all. He was experimenting with a fallen meteor to turn people into Werebat creatures for…some reason. His plan didn’t seem to have any endgame so his experiments just seemed to be for the sake of doing them. I can get behind Vandal Savage being casually sadistic enough to turn people into human/bat hybrids just because he happens to be bored that decade but the suggestion is that he was drawn to the energy the meteor was giving off and had a desire to understand it. Nothing in the story suggested that he reached any level of understanding or was going to use that knowledge to do anything. I liked the retro horror influence on aspects of the episode. The WereBats looked a little silly but seeing an attack from their point of view was really effective. It should be noted that Gremlins director Joe Dante directed this episode and his style is a perfect fit for the horror elements balancing with the fun of the 50s setting. He seems to understand that above all this show about time travelling superheroes is supposed to be fun and brings this across well. In general the group dynamic is growing stronger in really interesting and unexpected ways. There are growing more comfortable around one another but there’s also an element of cabin fever settling in. This is shown in hilarious ways such as Jax being irritated with Stein for the way he speaks which causes Stein to respond with more causal language in a condescending tone. Sara shows no willingness to let Stein completely bury himself in the part and boss her around when he tries to make her get him coffee. Having them get on each other’s nerves adds a real depth to the team dynamic. The cliffhanger ending was reasonably well done but it further highlights the ongoing problem of Chronos. He doesn’t even resemble a character as every use of him has been as a function of the plot to move the team into another time period or create an obstacle for them. Beyond that he serves no other function but the prospect of Ray, Sara and Kendra trapped in 1958 with no way back is a good lead in for the next episode and I expect a lot more Back to the Future references as they discuss ways to get back. A solid episode that really takes advantage of the casual prejudice that existed in 1950s America. Jax and Kendra are really allowed to come into their own in ways that they haven’t before and Sara develops in really interesting ways. Vandal Savage is the weak link as usual with his blending in being completely unconvincing and a plan that doesn’t seem to have any purpose. The 50s setting is fun and the character interactions are deepening with each subsequent episode so there is a real sense that this show is finding its feet.